Try 3 classes for just $39 and see the benefits of The Bar Method! After that, you can get your first month for $99 - with no long-term commitment! 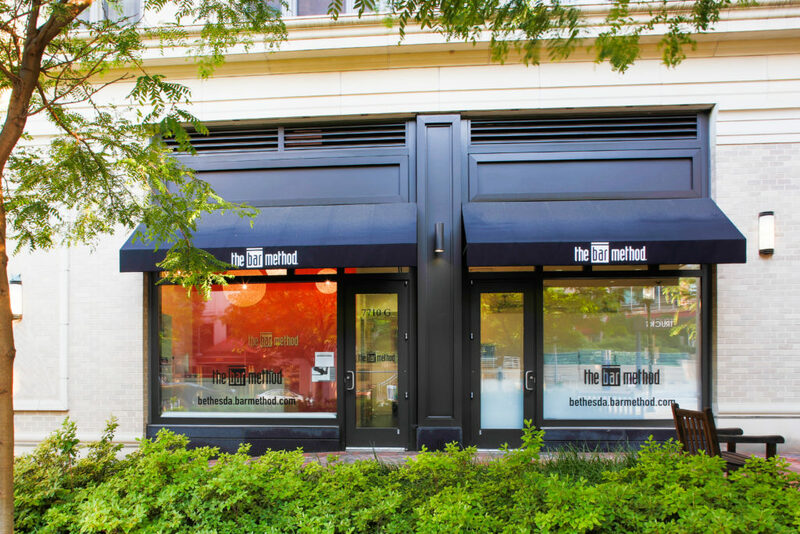 The Bar Method Bethesda is a boutique fitness studio offering barre classes for students of all levels. The signature method uses your own body weight, the ballet barre and a few props to create a transformative workout that results in long, lean sculpted muscles. Not only does it reshape your entire body, but it allows you to channel your inner strength and leave class feeling strong, confident and poised. Highly-trained instructors customize the exercises to ensure they are safe and effective for any age and every body, including modifications for pregnant women and students with injuries. Our staff and community are here to support you from the moment you walk through the door. We are located in the heart of Bethesda - close to the Bethesda metro. Our studio features a gorgeous workout space and a locker room with towels and toiletries. We are open 7 days a week with classes throughout the day. There is a Montgomery County parking garage on our block. Kate Arnold, owner of The Bar Method DC, Bethesda, and North Potomac, is a graduate of Duke Law School and The University of Chicago Booth School of Business. Kate discovered The Bar Method while living in Chicago and fell in love with it instantly. The Bar Method changed her outlook on health and fitness in addition to transforming her body. An immediate “addict” of The Bar Method, Kate opened the DC studio in 2011, because she couldn’t imagine living in a city where The Bar Method didn’t exist, and opened the Bethesda location in 2013. Classes fill up quickly, but spaces will open up as clients reschedule. If you’d like to attend a class that is full, please add your name to the waitlist. When other clients cancel, you will be notified via email if you are put into the class. If you have opted-out of our email list, you will not receive these emails. You are responsible for your reservation if you are put into the class from the waitlist. If you do not cancel your class and do not attend, our standard cancellation policy will apply. You could be added to the class up to 60 minutes prior to class. If you no longer want to be put in the class, please cancel your waitlist spot so that someone else can take the spot. We have clients that can get to the studio with very short notice. If this is not the case for you, please carefully manage your waitlisted reservations. You must cancel prior to one hour before the start of class to avoid a late fee. If you use are using an unlimited package (including our Bar Star & VIP memberships) or are attending a “FREE CLASS”, you will be charged $10 if you cancel within the hour before class and $15 if you are a no-show. Please wear exercise pants that cover the knees, a top that cover the midriff, and socks that cover the entire foot (toeless socks and ballet shoes are not permitted). Only water in capped bottles is permitted in the exercise studios. Colored liquids are not permitted in the studios. Cell phones are not permitted in the exercise studios. Lockers are provided with keys and we ask that you leave your phone in a locker along with the rest of your belongings. Gum, candy, and food is not permitted in the exercise studios. If you are pregnant and a current student, please provide a doctor’s note permitting you to take class. If you are pregnant and have NEVER taken a Bar Method class at our studio, you must take a level one class prior to taking a mixed class and you must provide a doctor’s note stating that it is safe for you to exercise. Clients must be at least 13 years old to attend class. Clients under the age of 18 must be accompanied by an adult to their first class and the adult must sign our client waiver. Please notify front desk staff and instructors of any illness or injury that may impact your ability to exercise. We do not provide child care. Children under the age of 18 cannot be left in the lobby while a client takes class. There is a Montgomery County parking garage on the same block as the studio. Parking is $1 per hour during the week and free on weekends! You can enter the garage on Woodmont Avenue or Old Georgetown Road. Bar Star members receive one complimentary membership freeze for every six months of active membership. The maximum duration of a Bar Star freeze is 3 months. Additional Bar Star freezes may be purchased for $50 by contacting the studio. VIP and Club Bar Unlimited members are allowed to freeze their membership at no charge twice per calendar year. Freezes may last between 10-30 days. Additional 10-30 day freezes may be purchased for $25 by contacting the studio. Class packages expire 1 year from purchase date. All classes are non-transferrable and valid only at the DC, Bethesda & North Potomac studios. Unused class packages and unworn retail items with tags attached are returnable up to seven days following purchase. Bar Star members receive three complimentary guest passes per membership year. To use a guest pass, please email [email protected]. Members must attend class with their guest. VIP and Club Bar Unlimited members receive six complimentary guest passes per calendar year that can be used for first time clients only. To use a guest pass, please email [email protected] Members must attend class with their guest. Guest passes do not roll over year to year.